>javac HelloWorld.java >java HelloWorld Hello, World! As groovy is mainly script-like language, it is run directly. But it can be compiled and executed as well. >groovyc HelloWorld.groovy >groovy HelloWorld Hello, World! >scalac HelloWorld.scala >scala HelloWorld Hello, World! 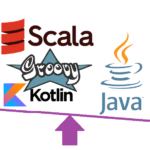 >kotlinc HelloWorld.kt >kotlin HelloWorldKt Hello, World! Groovy syntax is same when it comes to class, method, constructor & methods. Main intentions are to use groovy as script & not as plain old OOPS.